Tom Weber for State Representative accepts monetary donations to keep the campaign up and running. Volunteers are also needed to spread the word. There are no qualifications required to volunteer for the campaign. 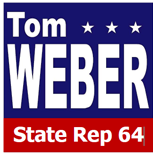 Tom Weber for State Representative needs people that are willing to contact others about the election, petition for signatures, help with placing campaign signs, riding parade floats, and more. We need as many volunteers as possible to win this election. Email us to sign up as a volunteer for the campaign.